Old Trafford, Manchester - Manchester United Blog: The Manchester United way is best. 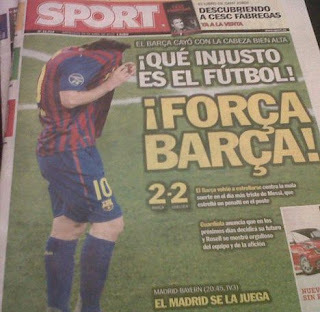 This was the response of the Barcelona based 'Sport' newspaper. And outside of west London there are many who would share these sentiments. Chelsea's uber-defensive approach would have won few admirers among the purists. Indeed the very existence of 'the Chelsea project' is an anathema to many; an expensively assembled mob of over paid mercenaries dressed in the colours of a 'soulless' club that is no more than an oligarch's plaything. For the blues to take their place in the final at the expense of a club like Barcelona - a club that prides itself on doing things the right way - seems to many like a disgusting injustice. Much of the sympathy for Barcelona is based on what is seen to be 'morally' right. The Catalans, who only recently succumbed to shirt sponsorship, have always wanted to be seen as a 'more than a club' or 'mes que un club' as their motto goes. Home-grown players make up the bulk of the team; the playing style is defined by aesthetics and the attitude of those representing the club has always been one of respectful and gracious dignity. They are the great ambassadors. Indeed, that they have been so successful with their brand of tiki-taka football has led many to see them as the one shining light in football; the saviours of the game. If only everyone played football like Barcelona. Anyone questioning this idea is branded a heretic; banished to the temple of the anit-christ, Mourhinho and his arch demon Ronaldo. Because, it was said, Barcelona's football is wonderful and morally superior to everything else. And yet, over the past four years of Guardiola it is impossible to recall a truly great match involving the pass masters. There have been many truly great performances, but where are the great matches. All the great sides, down through the years, have been involved in great games. Games that ebbed and flowed; were packed with incident and saw heroes emerge in the most remarkable ways. Think of the FA cup semi final replay in 1999 between Manchester United and Arsenal. The match between England and Argentina at the 1998 world cup; Holland v Czech Republic 2004 or the 2005 Champions League Final. The two 3-3 draws between pre Guardiola Barcelona and Manchester United back in 1998 were amazing football matches. And yet such wonderful spectacles have been absent in the Guardiola era as his possession greedy philosophy has smothered opposition teams into impotence. For this reason it is hard to understand how fostering a style of play that seeks to obsessively hoard possession can be good for football. Football is about matches, not mis-matches. Neutrals want to see a balance between the two teams opposing one another; to see a balance between attack and defence and while we can't critisise Barcelona for playing in a way that works for them, we can question their supposed moral superiority. Because Barcelona do not play in the way they do in order to benefit football as a whole. No club does that. Barcelona play to win and like all great clubs they play in a way that is compatible with their identity. It is a style that is designed to benefit Barcelona and only Barcelona. No club could be as successful as they have been without being single minded and having an uncompromising winners mentality. The Catalan's hoarding of possession was a fascination to behold at first as we marveled at their hypnotic control of the football but after a while it became boring. Once you've seen them do it a few times you've seen enough and, as a neutral, you long for a competitive football match to break out. For this reason, critism of Chelsea is unjustified. Chelsea cannot play like Barcelona. Had they attempted to do so they would have been pulled apart. Roberto Di Matteo has a responsibility to set his team up to get a result. In the grander scheme he had a responsibility to football to make a match of it. Therefore he adopted the style of play that he did out of necessity. If Barca had wanted a more open game they should have ceeded some possession to the Londoners. After all, you can't play if you don't have the ball. By way of contrast, last Sunday I was at Old Trafford to witness the 4-4 draw between United and Everton. It was an extraordinary contest full of exceptional attacking football. United had 52.5 percent of the ball. It was enough to score four goals against an Everton team that are not too far behind Chelsea in the league. At Camp Nou, Barca had 82 percent of the ball against Chelsea's 10 men. They only scored two goals. Two years ago they had 70 percent of the ball at the Emirates and drew 2-2. Both of these matches were one-sided and boring in the extreme with the only excitement occurring when the inferior teams managed to break out and score. If Barca had scored a bag full against either Chelsea or Arsenal it would be hard to argue a lack of entertainment. Goals are goals after all and Messi's five-fer in the round of 16 was a pleasure to watch. But in the average Barca match they spend so much time knocking the ball around that the viewer switches off. So forgive us for not lamenting the exit of the great Barcelona on this occasion. We have the utmost admiration for them and their ethos. They are the best team on the planet. But we do not share the view that they are morally superior. Manchester United, Real Madrid and Bayern Munich are easily their equals in terms of history, prestige and contribution to football. The great Italian sides gave as much to the art of defending. Watching the semi final between Real and Bayern last night it was hard not to feel a warm sensation that this was the kind of football we know and love. Two teams, both flawed and brilliant, playing a match that either could have won. It was exactly what we had tuned in for. How inspiring to see Ronaldo, Robben, Ribery, Kaka and Higuain charging at defenses with the match on a knife edge. This is the way that Manchester United play football. We always do it the hard way; always give the opposition a sniff. As former England cricketer Michael Vaughan said of Shane Warne 'You always fancy scoring off of him which is what makes him so dangerous.' And United are similiar. Perhaps - along with jealousy - that is why have so many critics; we are always fallible but isn't that what makes us human. You attack/ We attack is the United way. So for now we've had enough of the suffocating blanket possession of Barcelona. Let 'matches' prevail for a while. We watch football to see our teams win of course. But we also watch it to see contests. That is why the Manchester United way will always be more exciting and romantic than Guardiola's possession fetish football.